Meadowridge Common: The Rondebosch Common Restoration Project and the introduction of Moraea aristata to the Common. The Rondebosch Common Restoration Project and the introduction of Moraea aristata to the Common. After the business of the AGM, our guest speaker, Alex Lansdowne, Restoration Horticulture Conservationist, presented his talk on the restoration of the enigmatic Moraea aristata to Rondebosch Common - a great way to kick off the Rondebosch Common Restoration Project. Meadowridge Common hopes to put a similar project into action one day in the near future. Alex Lansdowne, guest speaker for the evening. Roger Graham, chairman of the Friends of Meadowridge Common, thanking the evening's guest speaker, Alex Lansdowne for his most interesting talk. There are many conservation stories of species only just holding on against extinction. Moraea aristata stands out. This critically endangered, enigmatic irid has persisted on the grounds of the SA Astronomical Observatory for decades. Rondebosch Common, a sister conservation area to Meadowridge Common, is the only natural habitat left within its range. 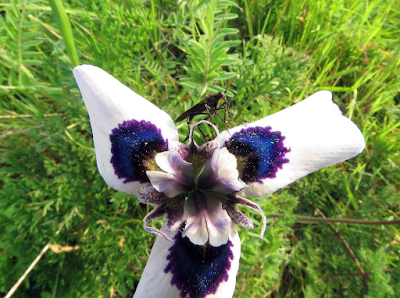 Together with the Friends of Rondebosch Common, Alex Lansdowne managed the introduction of the Peacock Moraea (Moraea aristata) to Rondebosch Common which shares a similar veld type (Cape Flats Sand Fynbos) to Meadowridge Common. The talk focused on the first year's work establishing a new population of Moraea aristata, and the ambitions of the Rondebosch Common Restoration Project over the next three years when it will be seen if the introduction can be declared a success or not. Thanks to Zoe Paulson for the link to her blog, Notes from a Cape Botanist where you can read more about the project and also to Graham Duncan (who supplied the bulbs for the project) for his article on Moraea artistata in PlantZAfrica.